Transitions abound in daily life. Sometimes the transition is so subtle, that you only notice a total transformation in retrospect. Like comparing your life 10 years ago to how it exists today. And sometimes a transition can be so abrupt that it smashes you square in the nose. Our economy anyone? This image of a moth taking refuge on the outside of my bathroom window is comprised of a few transitions. The obvious is the transition of color and tone. Green/Dark to Yellow/Bright. Second is the transition from inside to outside separated by a pane of glass. And third, the most important, is the transition of life. Moths, once emerged from their cocoon, only live for a few days to mate and then their life is spent. This moth's life has long since passed, decomposed, and become a part of the earth. Another transition. Life is full of transitions. Reflect on them. Make pictures of them. Well I've finally made the leap into upgrading my camera body and my first impressions of the Canon 5D Mark II is that it is a very, very nice piece of equipment. I haven't had the opportunity to really put it through it's paces. Judging by what I have done though, such as the image here, I have the feeling that I'll be very pleased with the files that I'll be bringing home. It's a definite step up from my trusty 20D that I've had for so long. I'm really looking forward to working with video again. It's been a while but hopefully some things will come back to me and I'll be producing some nice multimedia content soon! It's going to be fun to say the least! Today is Earth Day"! What will you do to celebrate? Plant a tree? Go on a hike and pick up trash along the way? Recycle all those brown paper shopping bags you've been collecting...then buy canvas ones? Start an Organic Garden? There are loads of options for each of us to do our part, but the main thing is to actually do it! And what is even more important is to continue doing it! Do you have something planned for Earth Day? Let us all know in the comments below. Your ideas may inspire someone else to do the same! PlantABillion.org - An initiative to Plant One Billion trees in the Atlantic Forest of Brazil. For each $1 donated they'll plant one tree! There's tons more out there. Just do a google search on "Earth Day"
This post is a test. It was sent from my phone! The importance of exploring the scene at which you're photographing is often discussed. I don't know if any one would actually argue against this idea, but I do know that we can often get caught up in a single composition or even at the same camera settings and forget to "have a look around". 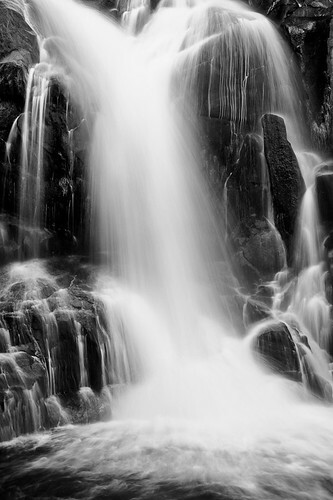 The image shown here is a detail of the same waterfall from my previous post. If you look in the upper right corner of the image you'll see where this composition was derived from. I always try to push my self into a completely immersed state when I'm out photographing, being aware of all my surroundings to find alternate compositions and find the subtle nuances of light. I always ask my self if this is the best that I can do? How can I make this better? Am I doing anything new? Does this speak to me? What does it say? What am I trying to say? What's next? It's ok to leave questions unanswered, but as long as you're asking them you'll heighten your awareness and involvement in the process of it all. You'll begin to make images instead of take them. The above image is from the same session and location as the previous post. The Corlieu Falls are just downstream from where the other image was taken. Lewis Creek is a wonderful area that offers very easy hiking and not to mention extremely accessible. If you're ever traveling to Yosemite National Park and are taking Hwy 41 to get there, it's just off the right side of the road before you reach Fish Camp. There's a sign for the trail head just before you reach the large turn out for parking. As I mentioned before, William Neill and I have been working on his new ebook, "Meditations in Monochrome" and it is now available for the world to see. I have to say that the conversions have come out beautifully and Bill's work has always had the design inherent in the images that make for very strong black and white compositions, even though he's primarily worked in color for the majority of his career. Ansel Adams once said about his color work that he "sees in Black and White"! It is true inspiration in every sense of the word. So check it out. You can read more about it here or comment and leave feedback about it on his blog. Also I'm sure you've noticed some changes around the blog, including the new little flickr widget in the sidebar. I think it's fun! Hope everyone had a great Easter weekend! As always, comments, feedback, scrutiny, etc. is welcome in the comments below. Black and White photography has made a huge comeback with the advent of digital and the power of post processing. More and more photographer's are spending more time converting their color images to black and white than they were capturing images on black and white film. My film days are probably pretty equally split between using black and white emulsions and color transparency films, and now my digital days are working out to be pretty much the same balance as far as time spent on color vs. black and white processing. The control that digital presents has made it very easy for all of us to leap into monochrome. Though that doesn't always mean that the leap will lead us to Ansel Adams quality. I've been working on a new ebook for my boss, mentor, and friend, William Neill, titled "Meditations in Monochrome". This new body of work that Bill has put together is entirely made up of color images that have been converted to black and white in the "digital darkroom". You can view an online portfolio of some of the images here. We've been using Lightroom and Photoshop CS4 for the conversions and it's been a very interesting and exciting process. Bill has written a wonderful essay to accompany the images that sheds some light on what makes a good black and white image as well as some insight into the post processing. I'll be sure to post when the book is released, which should be very soon! I know I've written something along these lines before, but I do plan on expanding on the process here on this blog. And I do plan on following through on the previous tutorials I've mentioned before. Enjoy the image, and as always, comments, critiques, as well as all other manners of feedback is welcome.